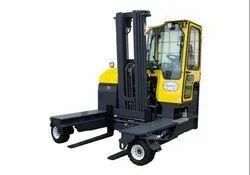 Prominent & Leading Wholesale Supplier from Chennai, we offer side loader forklift, side loader truck, multi directional side loader, combilift side loader truck and industrial side loader truck. 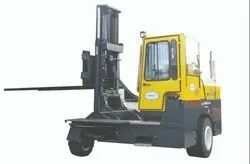 We promote Side Loader Forklift. Long loads are difficult to maneuver into confined space due to its size. Side Loader Forklift differentiates itself from the traditional sit-down side loaders by offering operators the opportunity to drive in four directions. The Slide loader Truck allows companies to have the benefits of narrow aisles, superior manoeuvrability and the ability to block or bulk stack by driving forwards. 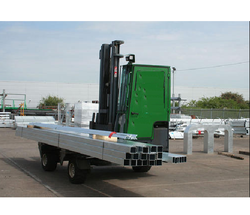 Combilift Side loader is ideal for an operation that requires a reliable, Robust and fast operation, when moving product across extensive sites and offers considerable benefits over the other machines in the market. Rubber mounted half open cabin. 4-way lever positioning of the wheel.